Today, the Federal Court of Appeals in California reversed the dismissal of the Segway lawsuit alleging Disneyland must permit Segways. The court handed Disney a mixed decision, holding, on the one hand, that Segways could be necessary (an important word) for some people to use in Theme Parks, but, on the other hand, that Disney still had the opportunity to prove Segways could not be safely operated in Disneyland or California Adventure. Bear with me while I get a little geeky. The first part of the 13 page decision addressed whether the plaintiff, Tina Baughman, was bound by assertions she made in prior lawsuits where she had said she had to use a wheelchair. These prior lawsuits had been brought against other defendants who, so Baughman claimed, failed to comply with the architectural requirements of the Americans with Disabilities Act (ADA). She settled those and this, the court held, meant she could not claim she was only able to use a Segway, instead of a wheelchair, when she went to Disneyland. In the end, this aspect of the decision was pretty empty, given the rest of the decision and the fact that there are plenty of folks, other than Baughman, willing to claim they are only able to use a Segway in a theme park. Holding Baughman could use a wheelchair in Disneyland did not materially help Disney because, according to the court, the fact that a Segway was not “necessary” for Baughman to enter the theme park didn’t resolve the important question. Disney, the court said, misinterpreted the ADA. As I explained in an earlier post (involving the Walt Disney World Segway lawsuit) Disney interpreted the ADA to require that an accommodation must be “necessary” as in “at least arguably indispensable or essential.” The court, however, said Disney put too much emphasis on one word, “necessary.” The ADA does not simply look to whether an accommodation is “necessary” but to whether the accommodation permits the “full and equal enjoyment” experienced by non-disabled guests. A theme park “must start by considering how their facilities are used by non-disabled guests and then take reasonable steps to provide disabled guests with a like experience,” the court said. The decision does not mean that Segways must be permitted in Disneyland tomorrow. Disney, the court explained, “might be able to exclude them if it can prove that Segways can’t be operated safely in its parks.” Short of a settlement, this will likely mean the trial court will have to hold a hearing so Disney can, as it did in obtaining court approval when it settled the Walt Disney World Segway lawsuit, present evidence that guest use of a Segway in Disneyland would present concrete safety risks to other guests. So, to summarize the status of the Disney Segway lawsuits, the next step in Disneyland will probably be a hearing so Disney can have the opportunity to prove that there can be no safe use of Segways in Disneyland (or California Adventure). The federal court in Orlando has approved the settlement of the Walt Disney World Segway lawsuit. The terms of that settlement provide that Disney can prohibit Segway use in all its U.S. Theme Parks. That approval has been appealed, though to date, there has been no ruling by the federal court of appeals. So, if the Walt Disney World settlement is ultimately approved but the California court rejects Disney’s safety argument at Disneyland, Disney could ban Segways in Walt Disney World but not be able to do so in Disneyland. One thing is certain, this is not the last we have heard of the Disney Segway lawsuit adventure. 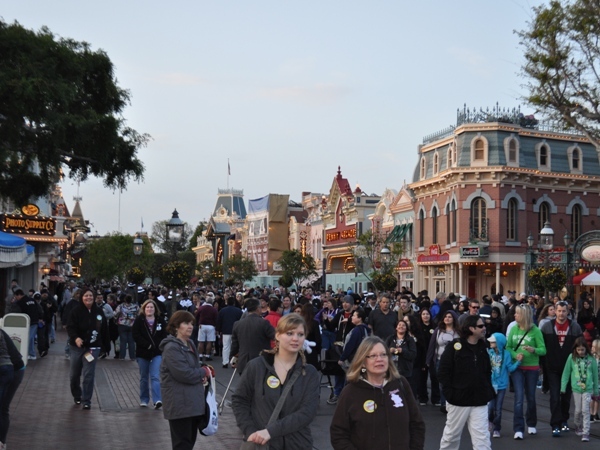 Have you noticed Disneyland Main Street USA?